Long overdue, first two stands of the Białystok new stadium were approved by the construction supervision and will see first spectators on Sunday. Now preparation for second phase of the project begins. First two stands of the new Białystok municipal stadium were to be delivered in February, but with contractors problems at the start of works the municipality prolonged the deadline to July 1. Still, Spanish company OHL didn't manage to meet this date as well. Finally yesterday the stadium's first new sections were approved for use by local construction supervisor, following positive reviews by the fire department and sanitary board. This allows Ekstraklasa club Jagiellonia to hold their home opener on August 24, against Pogoń Szczecin. Before that authorities are to hold a community day at the stadium this Sunday. Throughout the upcoming season new stands accommodating some 7,700 people will be the only ones available for Jagiellonia supporters as OHL launched preparatory works for phase two – enclosing the entire stadium with similar structures. The contractor has 11 months to deliver roughly 60% of the new 22,500-seater. 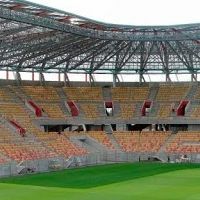 The stadium was divided into two phases to assure constant use by Jagiellonia's players and fans and not overcharge the public budget with contracting the entire project at once. Though initially hoped to cost some PLN 156 million (€38m / $54m), the project is now to reach nearly 260 million (€61m / $81m).